In Python, Both range() and xrange() functions produce the integer numbers between a given start value and stop value. So What is the difference between range() and xrange() functions? Let’s check it out. 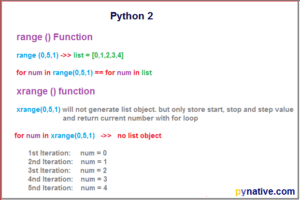 In Python 2 we have the following two functions to produce a list of numbers within a given range. in Python 3, xrange() is deprecated, i.e. xrange() is removed from python 3.x. 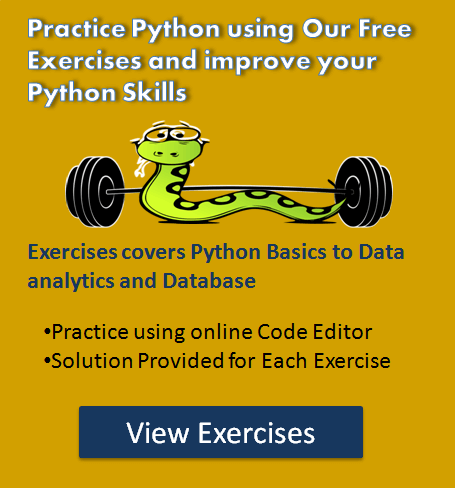 Now In Python 3, we have only one function to produce the numbers within a given range i.e. range() function. But, range() function of python 3 works same as xrange() of python 2 (i.e. internal implementation of range() function of python 3 is same as xrange() of Python 2). So The difference between range() and xrange() functions becomes relevant only when you are using python 2. There are many differences between these two functions concerning performance, memory, speed and internal implementation. Both implemented in different ways. Let see this one by one. In terms of functionality both range() and xrange() functions generates integer numbers within given range. i.e,. range (1,5,1) will produce [1,2,3,4] and xrange(1,5,1) will produce [1,2,3,4]. So no difference in terms of functionality between range() and xrange(). range() creates a list i.e., range returns a Python list object, for example, range (1,500,1) will create a python list of 499 integers in memory. Remember, range() generates all numbers at once. xrange() functions returns an xrange object that evaluates lazily. That means xrange only stores the range arguments and generates the numbers on demand. It doesn’t generate all numbers at once like range(). Furthermore, this object only supports indexing, iteration, and the len() function. On the other hand xrange() generates the numbers on demand. That means it produces number one by one as for loop moves to the next number. In every iteration of for loop, it generates the next number and assigns it to the iterator variable of for loop. range() return type is Python list. xrange() function returns xrange object. print "The return type of xrange() is : "
We tested the speed of both the functions with a timeit module to test which code is faster. Let’s see the result. In our speed test, we found xrange() is faster than range. We executed above loop 5 times and found average time per loop with xrange() is 52.3 millisecond. So it’s clear now xrange is faster and saves memory. As you know, xrange doesn’t generate a static list at run-time as range does. xrange() creates the values on demand as you need them using a technique called yielding. The range () function produced all numbers instantaneously before the for loop started executing. The main problem with the original range() function is it uses a considerable amount of memory if you are producing a vast range of numbers. xrange() function always produces the next number on the fly, i.e. only keeps one number in memory at a time to consume less memory. The advantage of the xrange function is it always takes the same amount of memory, no matter the size of the range it represents. There are consistent performance advantages. Let see the scenarios where we can use range and xrange. If you are dealing with an extensive range of numbers, then I recommend you to use xrange(), i.e. you should always favor xrange() over a range() if we want to generate the vast range of numbers. xrange() is very helpful if your system has less memory like cell phones. Using xrange(), you can prevent memory overflow errors. As xrange() resolves each number lazily, if you stop iteration early, you won’t waste time creating the whole list. If you want to iterate over the list multiple times, then I recommend you to use range(). Because xrange has to generate an integer object whenever we access an index, this can overhead. If you need to generate fewer numbers, then go for range() function. The range () returns the list so that you can use all list operations on it. On the other hand, you know xrange() returns the xrange object, so you can’t use all list operations on it. Compatibility of code – If you want to write code that must run on both Python 2 and Python 3, use range() as the xrange function removed from Python 3. You will get “python xrange not defined” error if you try to use xrange() in Python 3, xrange() is removed from Python 3. 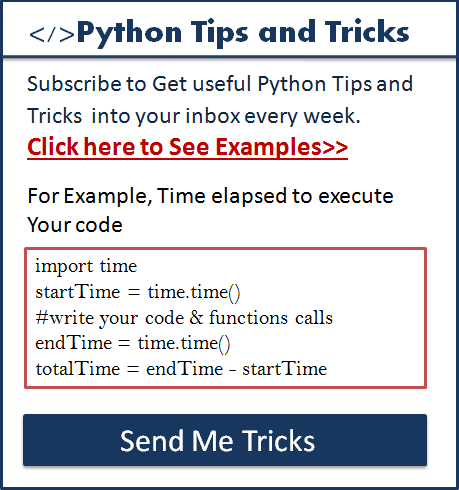 If you try to import xrange() function in Python, you encountered an error. You will get this error NameError: global name ‘xrange’ is not defined in Python 3. better to use range(). Thank you ! Very helpful and detailed article. in our case we are using range () function beacuse it works in both the major version of Python. Hi Alex Thank you for your feedback.